Written on March 3, 2015 . Posted in Announcements + Updates, Architecture and Design. 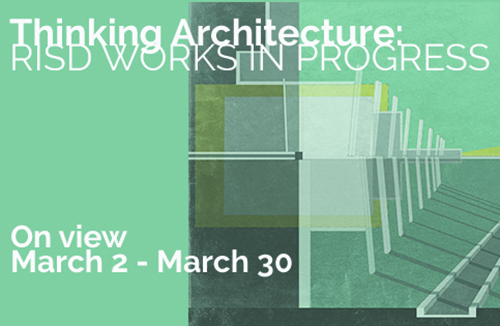 City of Providence Mayor Jorge O. Elorza and the Department of Art, Culture + Tourism invite you to visit the Gallery at City Hall for its newest exhibit Thinking Architecture: RISD Works In Progress. Presented in partnership with Rhode Island School of Design, this new exhibit is a showcase for the ongoing thesis work of 62 architecture undergraduate and graduate students at Rhode Island School of Design (RISD). This exhibition marks the midpoint of the thesis track at RISD, and it is considered an essential part of the Architecture curriculum. RISD will bring the work of the future architects to a broader audience, and to the core of the City of Providence, in an attempt to showcase the role of architects in the transformation of the built environment. The exhibit is on view in the Gallery at Providence City Hall March 2nd – 30th with a reception on Thursday, March 5th from 5pm – 7pm.